At the end of EarthBound, after winning an epic, emotional, and unforgettable final battle against the evil Master Giygas, the game’s hero, Ness, returns home only to receive a mysterious letter from Pokey, the game's secondary villain who escaped during the final battle. Ending on a cliffhanger, players across the world naturally anticipated EarthBound’s sequel, MOTHER 3 from the moment they beat the game. The third title in Shigesato Itoi’s oddball MOTHER series, MOTHER 3 was first announced in 1996 as a title for the upcoming Nintendo 64. As the new system was capable of rendering expansive 3-D worlds and much better sound and graphics than the Super NES, the possibilities for MOTHER 3 made fans giddy as they waited. And waited, and waited, and waited. Development on MOTHER 3 dragged on and encountered problem after problem. After six years of development nightmares, the project was deemed unsalvageable and canceled in mid 2000. Even after it’s cancelation, MOTHER 3 topped most wanted lists in Japan and America for years. In 2003, Itoi and Brownie Brown quietly began work on a new version of MOTHER 3 for the Game Boy Advance, and released the first of screenshots only two months before MOTHER 3 was finally released in April 2006, a full decade after it was first announced. The first mother MOTHER 3 details alienated fans who were anticipating the direct sequel EarthBound’s ending hinted at. The pre-pubescent heroes and contemporary suburban locales that were previously the series’ calling card were nowhere to be found, instead the screenshots depicted a world reminiscent of the American Old West. Not only is the setting deliberately unfamiliar, but the opening chapter revolves not around children, but a balding cowboy with a wife and two children of his own. Oh, and don’t worry about spending too much money, since nobody in town has even heard of the stuff before. 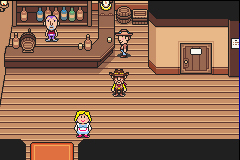 In fact, MOTHER 3’s setting and characters are not only totally non-sequitur to MOTHER 2, but are so discordant and random that they appear to lack any independent context with which to stand on. Despite this unexpected twist, MOTHER 3 fits right in with it’s predecessor in terms of gameplay. MOTHER 3 carries over the psychedelic turn-based battles of EarthBound with two significant improvements that helped make the 20 year old MOTHER battle system fresh and engaging in the age of motion sensors and high definition. Firstly, for the first time in the series, your characters actually appear on screen while attacking during battle, which despite being a purely cosmetic upgrade, goes a long way to keep the game from looking dated. Secondly, and more importantly, is the addition of the new sound battle system. 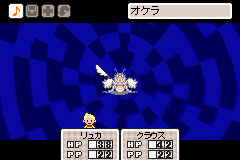 While mentioned only once during the game, timing your attacks with the background music is essential to getting the most out of MOTHER 3, and is almost a game within itself. Basically, when one of your party members is ready to attack, the game gives you a prompt at which you tap the A button in time with the beat, with each successful beat building up an up to 16 hit combo. It’s possible to play though the entire game without realizing that this combo system is in place, yet mastering it can easily mean the difference between winning and losing a battle. The addition of the sound battle system has two warmly welcome side effects. To accommodate the combo system, your character’s rolling HP meter now ticks down at nearly half the speed it did in EarthBound. Best of all, to keep the sound battles interesting and entertaining, MOTHER 3 features 60 DIFFERENT BATTLE THEMES! For those who can’t appreciate how astonishing that is, keep in mind that even fully “up to date” RPGs on a modern system like the XBox 360 or Wii typically only have between three and five different battle themes. MOTHER 3’s battle themes cover almost every genre imaginable, and include rock, techno, piano etudes, classical medleys, heavy metal, sambas, drum solos, creepy ambiances, dramatic overtures, and an awesome NES influenced chiptune jam, just to name a few. MOTHER 3’s soundtrack, boasting a total of over 250 tracks, is not only an impressive feat for the relatively primitive GameBoy Advance, but is also genuinely well written and thoughtfully produced music. The score makes excellent use of motif, and accompanies the action and settings perfectly, invoking tension, excitement, wonder, dread, and sadness right when the story calls for it. Don’t let the colorful graphics fool you into thinking this is a kid’s game. While there is relatively little on screen violence, the emotional storyline places MOTHER 3 among darker titles in Nintendo's library. Even so, MOTHER 3 still holds true to the EarthBound spirit, and is quirky and unique throughout; a worthy, rewarding and satisfying final installment in the MOTHER trilogy. 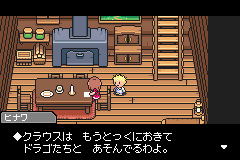 Unfortunately, Nintendo has shown absolutely no interest in releasing MOTHER 3 outside of Japan, but luckily, the icon based menu and battle system, and the option to name your characters in English make the game playable even if you can’t speak and read Japanese, and with a beautifully translated game script available online, it’s easy for anyone to fully enjoy MOTHER 3’s storyline.